Pakistan is hit by Worst Floods of its 63 Years history which has taken 2000 Lives and Millions lost their Homes. One of the reason of floods along with rains was excessive Water sent by India in Sutlej and Beas rivers that become flood by including in water of Rains. 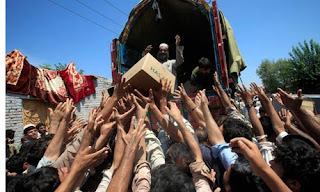 First India played role in Floods of Pakistan by sending excessive Water and now it is trying to throw salt on Wounds of Pakistan by offering $5 Million Aid. Indian Foreign Minister S.M. Krishna called Pakistani Foreign Minister Shah Mehmood Qureshi on Phone on Friday and offered $5 Million Hypocritical Aid for the Flood Victims. India on one side is Killing innocent Kashmiris and Sending excessive Water towards Pakistan and on other hand offering Aid. Pakistan must reject this Hypocritical Aid offer of India. Indian Government has built Dams on Pakistani water and when Pakistan is in need of Water India stops the Water and when there where lot of rains due to Moon Soon the Indian Government sent excessive Water through Sutlej and Beas rivers.